Today I'm going to show you how to apply vinyl stickers. I was hesitant to share this because it seems like everyone knows this. But I remember when I first cut some vinyl. Then I tried to apply it by picking up each individual letter. I wondered how everyone got their lettering so straight. Well, it's really simple if you know what to do. It's all about the transfer paper. It's almost like clear contact paper, but it's more tacky than sticky. It's also called transfer tape and it's sold wherever craft vinyl is sold. UPDATE 5-4-17: I now always use clear contact paper. It's so much cheaper and it's readily available - last time I grabbed a roll at the grocery store! Plus a roll of it will last a long time. Applying vinyl is like second nature to me now that I've been making and selling my menu boards with vinyl lettering. Sometimes I think that when something becomes easy for us, we think it's easy for everyone else too. Step 1 - Once your vinyl is cut, remove the excess vinyl that you will not be using. Step 2 - Cut a piece of transfer paper large enough to cover your vinyl. Then place it on top of your vinyl. Rub over it with your fingers or a credit card and make sure that the vinyl underneath will firmly adhere to the transfer paper. Step 3 - Carefully and slowly pull the transfer paper up. The vinyl should come with it. If it doesn't, set it back down and rub over it again in that area. It's important to go slowly, because then you can see if the vinyl isn't attached before you've removed the transfer tape completely and ruined your chance at having perfectly spaced lettering. Step 4 - At this point your vinyl should be on the transfer paper. Step 5 - Place the transfer paper in place where you would like to apply it and press down firmly all over the vinyl. Step 6 - Remove the transfer paper. Again, go slowly so that if a piece of your vinyl doesn't attach, you can rub over it again while it's in the correct position. Step 7 - Once the transfer paper is removed, I like to rub over the vinyl again just to make sure it's all firmly adhered. If you are applying more than one vinyl sticker at a time, you should be able to re-use the transfer paper. I generally use one piece to do all seven days of the week when I make my menu boards. If you feel like it's not working as well, then cut a new piece. 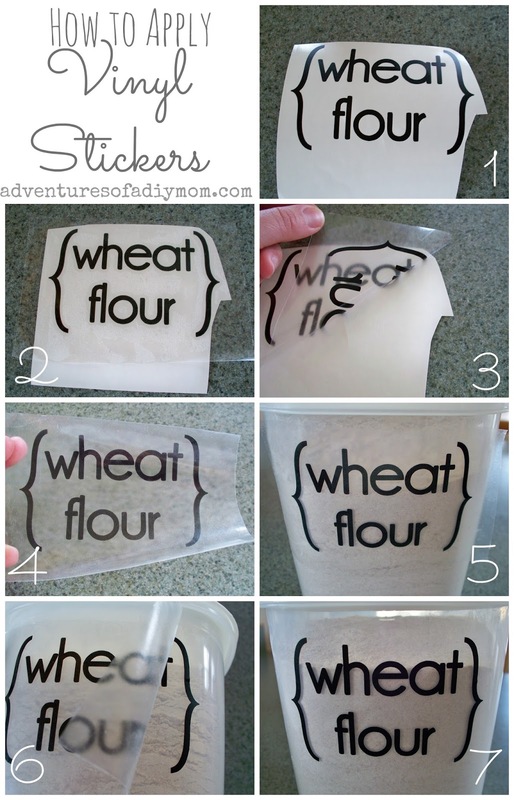 You can check out my 3 steps for an organized pantry where I used these labels.